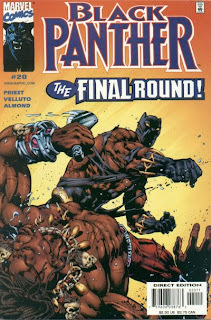 As I mentioned yesterday, this month I'll be trying to focus all of my posts on the Black Panther to celebrate the movie coming out in a couple weeks. Most of my topics I don't think will pose any problems. The character certainly has plenty of History, there's plenty of Business angles to discuss, the character has built-in "-isms" all over the place, and with the movie hype, I don't doubt there will be a good amount of Panther-related Links to post on Wednesdays. My "On Strips" pieces might be a tad more challenging. Not only has T'Challa never carried his own comic strip, but I can't even seem to find any instance of him every appearing in one. Not the long-running Spider-Man strip, the short-lived Hulk strip, or even as just a joke/gag character appearing in some other comic for humorous effect. I'm going to keep digging throughout the month, though, and we'll see what I can find. Today, though, I do have something interesting. 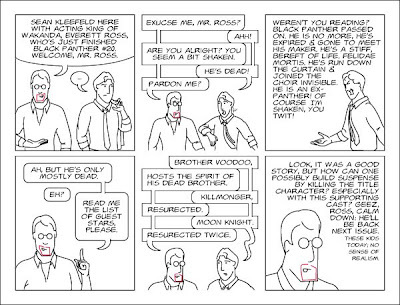 It's a comic strip that I wrote/drew back in the day that reviewed Black Panther #20 circa 2000. As I recall, I had been doing the letterhack thing for a year or so, and had gotten pretty decent at it. I seem to recall figuring I had a letter published on average every other week for at least 6 or 8 months. And while I hadn't gotten bored with that, I did want to up my game a bit. So I thought I would try composing my letters as comics. There was definitely a heavy Fred Hembeck influence there, setting myself up as the primary character who talked with the heroes, who were well aware of their role as comic book superheroes.